In a medium saucepan heat the olive oil over very low heat. Add the minced garlic and stir over a very low heat for about a minute. Cook over a low heat, stirring frequently, for 5-7 minutes until the vegetables have softened and are lightly colored. Add the canned tomatoes, tomato paste and the sugar and give it a good stir, then add the wine if you are using it. Bring the pot to a boil, stirring regularly, and then lower the heat to a gentle simmer. Cook the sauce uncovered for about 45 minutes, stirring occasionally. Add some salt and pepper to taste, and enjoy! I would like to send a big thank-you to my nephew, Jon Sacker for this recipe! Jon has been a wonderful supporter and contributer to startcooking.com. Being from the UK, he has often come to my rescue helping to interpret the amazing differences between cooking here in the USA vs. cooking in the UK. Love to you, Emma and the girls! I just adored the sound effects for the hurly-burly crowd of gathering ingredients in this video, Kathy. I really love how much fun the videos are, and the sound effects just get better and better. Yes, Shaula, here at startcooking.com our ingredients definitely have personalities! Miri, given your tummy issues, I am sure the sauce will taste just fine without the onions. Kathy, thhks for the good wishes. Miri, I’m not sure about leaving out the onion – have you tried making sure that they are well cooked and very soft? You could try using celery instead. Please also be aware that if you are using fresh rather than tinned (canned) tomatoes that you do not need to add the sugar. Also do try using different herbs such as oregano (dried rather than fresh) or thyme to give some different tastes. 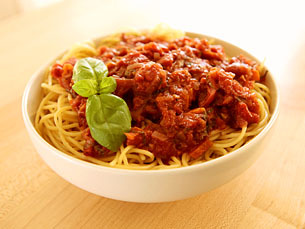 Rather than adding the tomato paste in with the canned tomatoes, try sauteing it in the oil along with the vegetables. Saute long enough (five minutes at least) for the color to deepen–you won’t believe the difference in flavor. I remember once working in a summer camp where we often made spaghetti since it’s cheap and plentiful. Sauces with all sorts of variations, mushrooms, peppers, bell peppers, etc. Once a group of Italian campers (this was an international camp) decided to cook for one evening and show us what the real tomato sauce..
Will, is it the tomato sauce or the woman who made the tomato sauce that brings back such wonderful memories! Many quick cooking tomato sauces have a delicious bright flavor, while longer cooking sauces develop a hearty deep richness that can only come with an extended cooking time. Both are fantastic! OK, I have used your videos time and time again and almost everything has come out super delicious. However, this particular recipe came out really bland. I admit, I did not have wine on hand, but still, the tomato sauce was kinda tasteless. Any thoughts as to how I can spruce up the flavor?? Oh dear, not good. Right now you can add some dried oregano, more garlic, a bit more basil, and some salt and pepper. The next time you make tomato sauce you might want to try another brand of canned tomatoes. “All canned tomatoes are not the same. One should not dismiss canned tomatoes if the first brand you try does not meet your standards. There are many to choose from. Please keep in mind that some brands may have superior canned whole tomatoes but their “roasted” canned tomatoes are rated inferior. This is one purchase where you really need to read the label carefully! Thanks for being such a loyal supporter of startcooking.com! Thanks for the tomato recommendations Kathy! I will give another brand a try!!! Keep up the great and fun work, can’t wait to see what you make next!!! Comments like yours bring me such joy – my goal has been achieved! Good Luck with developing your new found cooking skills! i made this last night… so quick and easy! the only thing i changed was… i chopped up the tomatoes alot so it wasnt so chunky… great! very tasty! Great to hear! It is surprisingly easy and tastes soooo much better than the stuff in the jar! I am growing tomatoes for the first time in years so I will be needing this recipe. Many thanks!!! Knowing how to make tomato sauce is essential. Are you making pizza or preparing pasta? This startcooking.com recipe video shows you how to combine tomatoes and other ingredients to make a versatile and tasteful tomato sauce. Enjoy!